Posted by Alicia Jaimes on November 7, 2018 in Lifestyles. 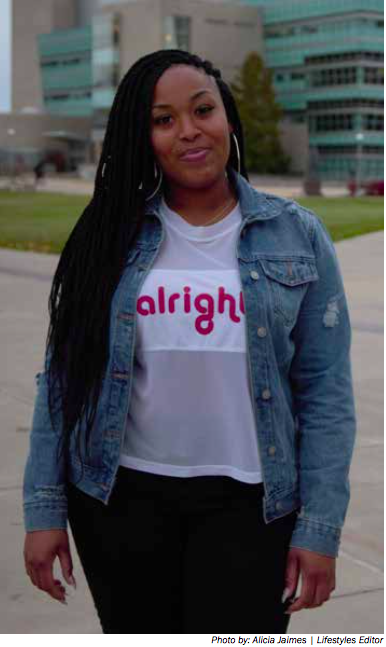 Ferris health information technology senior Tekarra Coleman didn’t think she was going to attend a university until her counselor gave her a push in the right direction. From Kalamazoo, Michigan, Coleman was never asked about the possibility of college at home. That is until her counselor called her into her office one day and asked if she ever considered Ferris. After learning about Ferris’ Tuition Incentive Program (TIP), Coleman decided to attend. Wishing she had more support back home, Coleman feels the struggle of being a first-generation student when family members don’t understand the college process and wish she’d visit more often. During her first year, Coleman gave in and found herself going back home a lot to visit her family and help where she could. The pressure Coleman felt made her realize something she hopes other first-generation students will recognize, as well. “You have to want more for yourself,” Coleman said, saying that it’s OK to let go and focus on what’s right for you. Coleman finds being at Ferris to be bittersweet. “Why was I so different?” Coleman said as she wondered why she had been the only family member to go to college. Having an older sister, Coleman was able to see her go off to college, only to leave later and decide it wasn’t for her. Because of this, she hopes to inspire her three younger siblings to attend college and learn a valuable life lesson. “If I put in the time now, it’ll be better for me in the end,” Coleman said. Until last year, there wasn’t a way to identify first-generation students. Now that there is, Ferris Retention and Student Success Academic Adviser Jody Maloney has been able to work closely with first-generation students, helping them get acquainted with campus and maximizing opportunities for personal and professional growth. “Many people expect first-gen students to be cautious or to not have a plan for their future, because their parents didn’t explain all of the little things about getting a bachelor’s degree to them, but the reality that I’ve seen is that first-gen students are ambitious and often choose programs that involve graduate school without hesitation,” Maloney said. To help create connections between first-generation students and faculty members, Maloney is taking part in a First-Generation Student Celebration from 1:30 to 4 p.m. Thursday, Nov. 8, at the University Center History Lounge. The event, which is open to first-generation students and their friends, allows students to take part in interactive activities and have a chance to win one of three textbook awards for spring 2019. “They want to achieve, and I find that inspiring,” Maloney said. For more information on the First-Generation Celebration, contact Maloney at malonj10@ ferris.edu.